One thing that really stands out as you walk around the garden at this time of year is the amount of plants which produce brightly coloured berries. They can be ignored in other seasons, but with these dark winter days and most of the autumn colour gone from the trees and shrubs, this group of plants come into their own and however common we may think they are, they deserve a place in our gardens. There are a few trees and shrubs that have a profusion of berries or fruit most years, and it is these I want to remind you of so you can plan some in for next year if you don’t have any already. evergreen shrub, part of the Rosaceae family and grown largely for its berries and glossy green leaves. It does also produce some quite attractive flowers but as these come out in early summer you may miss them with all the other exciting things sprouting in the garden. It is the berries in autumn and into winter (before the birds eat them) that really stand out. Most pyracanthas will grow to 3m if left alone, but I think they are best clipped back each year as they keep a compact shape really well. You prune them by cutting back any long shoots after flowering, keeping the dying flower heads intact as these will form the berries later in the year. As a plant group they prefer a sheltered site but will cope with sun or shade and are an ideal plant to grow and keep clipped under a window, making a very good burglar deterrent due to the large thorns I mentioned earlier. For a red berried variety try Pyrcantha ‘Mohave’ , which is a vigorous plant and easy to grow; if you fancy an orange berry try Pyracantha ‘Golden Charmer’, or ‘Golden Dome’ for a more yellow-orange berry. The second group I want to mention are the Cotoneasters – most people don’t realise what a large group of plants this is. Again they are part of the Rosaceae family and they vary from small shrubs to large trees. Some are evergreen and others drop their leaves in the autumn, called deciduous. 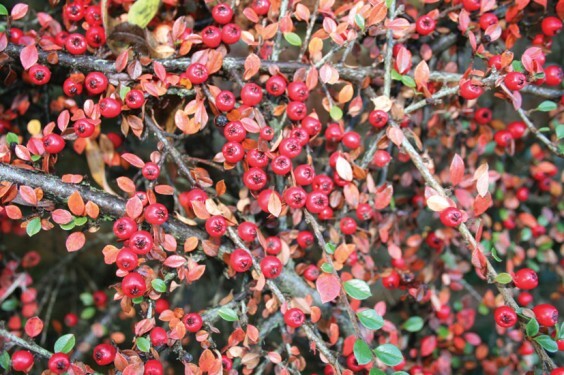 The really common cotoneaster that everyone will recognise is Cotoneaster horizontalis, with its common name ‘wall spray’ explaining its growth habit. Stiff horizontal branches spread out, usually to cover a garden or house wall. Just because it is common, don’t underestimate its uses – the small pinkish-white flowers in the summer are absolutely loved by bees, a very important feature these days as we try and encourage more of them into our gardens. The small dark green leaves turn bright red and orange in the autumn along with its bright red berries. It is easy to grow and ideal for someone with limited space. Alternatively, you can have very large cotoneasters that make excellent small trees or large shrubs. A good specimen is Cotoneaster frigidus; this is upright in its growth when young but develops a lovely weeping habit as it matures, or there’s Cotoneaster ‘Cornubia’ for an evergreen version. They also make an excellent large hedge as they will grow to a height of 20 feet if left unchecked, and can provide very good screening. As with the pyracanthas, you can get different coloured berries on these lovely plants. Cotoneaster ‘Exburyensis’ is yellow and Cotoneaster ‘Julliette’, although a little smaller at around 8 ft, has lovely variegated leaves that offer a fabulous contrast to the red berries. They really are a great group of plants and should be seen in more gardens in my opinion. These two groups of plants are not the only ones to look at – many of the shrub roses will have excellent hips well into the winter or the lovely crab apples that can have little brightly coloured apples clinging to their branches long after the leaves have dropped, looking almost like fairy lights on these dark days. Whatever your preference, do have a fresh look at these so-called common shrubs that brighten our gardens for Christmas.